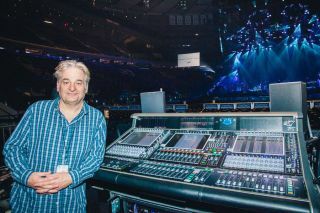 Veteran front-of-house engineer Toby Francis, whose extensive résumé ranges from Aerosmith to ZZ Top, is currently out on an 88-date tour with pop singer Ariana Grande and a DiGiCo SD7 digital mixing console. “The Honeymoon Tour,” which takes in North America, Europe and Asia before wrapping up in South America at the end of October, also includes an SD7 at the monitor position, helmed by engineer Justin Hoffmann. The SD7’s snapshot capabilities are proving to be invaluable on this tour: “It’s pop, so the levels are pretty drastically different from song to song. On a lot of the songs there’s an intro section, then into the regular song, so I use at least one snapshot to set up each song. A couple of the songs have more than one,” he says.